Rembrandt has the dubious distinction of being the most stolen old master, with 337 works of his listed on the Art Loss Register‘s database of stolen or lost art. One of those works, L’enfant à la Bulle de Savon (Child with a Soap Bubble), has been recovered after 15 years. 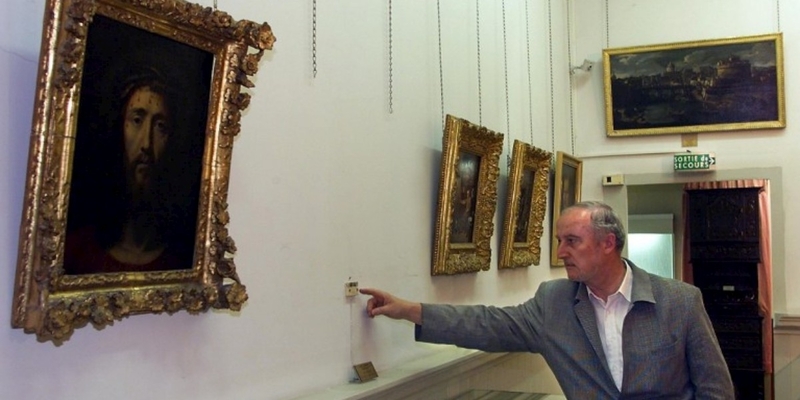 The painting was stolen from the Musée d’Art et d’Histoire in Draguignan, a town about 50 miles from Nice in France’s southeastern Provence region, on Bastille Day (July 14th) of 1999. Burglars broke in through the municipal library adjoining the museum while a military parade of tanks and armoured vehicles rumbled by. The alarm went off, but by the time the police arrived, the thieves and Child with a Soap Bubble were gone. The date of the theft is almost poetic when you consider that the museum’s extensive collection of art and antiquities was seeded primarily by confiscations from aristocrats during the French Revolution. It’s a small town, but in 1790 Draguignan was made the prefecture (administrative capital) of the department of Var, so many of the goodies confiscated in the area were collected there, ultimately giving the modest town a very impressive museum. The Rembrandt painting was confiscated in 1794 from the Château de Valbelle, a medieval castle near the town of Tourves (40 miles west of Draguignan) that was used by the Revolutionary government as a hospital in 1792 and was sacked for its treasures a year later leaving it in ruins today. After nearly 15 years with no leads, the Central Office for the Fight against Traffic in Cultural Goods (OCBC) in conjunction with the Nice police found the painting and made two arrests in just one day. On Monday, March 17th, they received a tip that a shady deal was scheduled to go down in a hotel the next day. On Tuesday, March 18th, they arrested two men, one in a building (presumably the hotel), the other in a car. One of them had the painting in his possession. The men are 46 and 53 years old. One was formerly an insurance salesman and both of them were already known to the authorities as petty criminals. They have both reportedly confessed to their roles in the crime and have been charged with concealing a theft and conspiracy. They weren’t charged with the theft itself, however. In a shocking turn of events, the actual thief has now stepped forward. Perhaps fearing that he was about to be snitched upon, the man turned himself into the police Wednesday on the advice of his attorney. 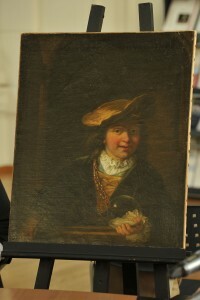 The man kept the painting at his home up until 15 days ago, Dupouy said, and had “wrapped it with great care”. His client “never earned a single centime” from the sale of the painting. “He was cheated,” he said, without explaining further. Cheated by Fric and Frac there 15 days ago? Because they didn’t earn a single centime either since they were busted trying to make the sale. Anyway, whatever he’s babbling about, he did take reasonable good care of the painting. The museum’s current curator Jeanine Bussièresa and her predecessor Régis Fabre who was curator at the time of the theft examined the painting to confirm it was the one stolen and they found it in good condition. It’s missing its frame, but other than that, it hasn’t suffered from spending a decade and a half wrapped up in this guy’s house. The museum is delighted to have one of its most important paintings back, although there are questions about its attribution to Rembrandt. Since the painting’s disappearance in 1999, new technologies have developed to authenticate works. 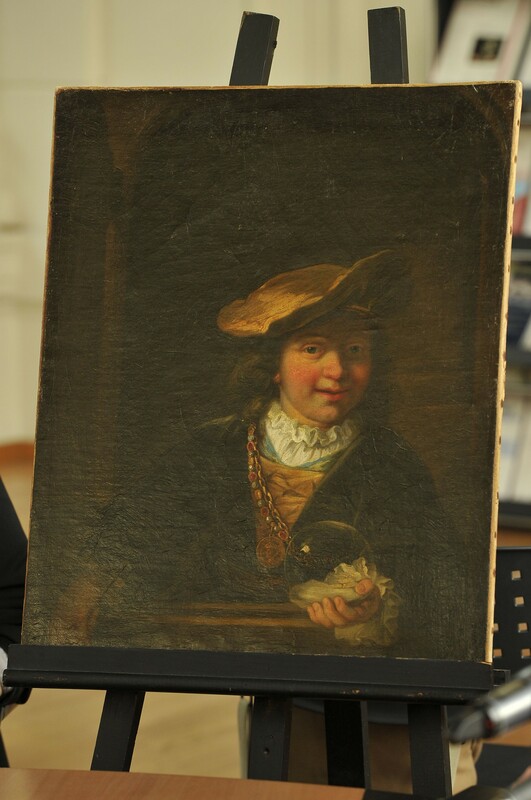 Now that he’s home safe and sound, Child with a Soap Bubble will be analyzed for conservation and to determine whether it was painted by the Dutch master himself or one of his students. This entry was posted on Saturday, March 22nd, 2014 at 12:13 PM	and is filed under Looting, Museums, Renaissance. You can follow any responses to this entry through the RSS 2.0 feed. You can skip to the end and leave a response. Pinging is currently not allowed. I bet the museum was truly delighted to have one of its most important paintings back, but I wouldn’t worry unduly about its attribution to Rembrandt. Every museum and private collector in the world has had to have its Rembrandts reassessed and re-authenticated. But I don’t understand why the Central Office for the Fight against Traffic in Cultural Goods and/or the police took sooooo long to find the painting. 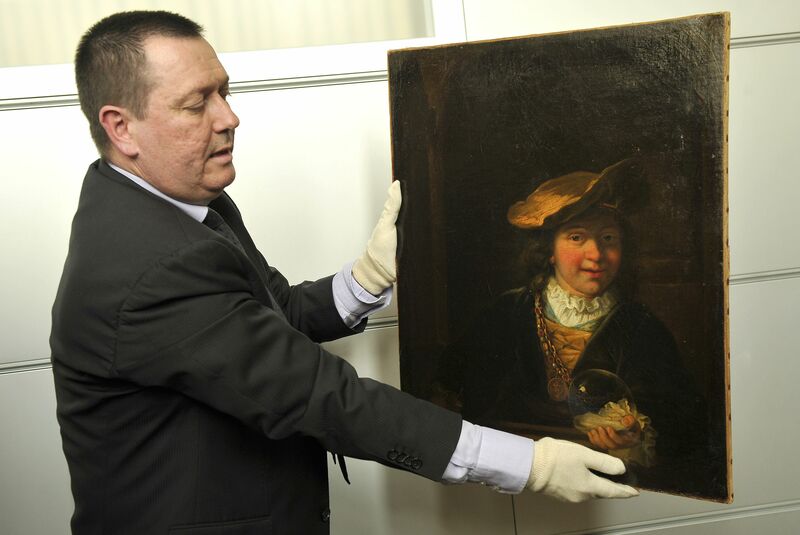 Imagine having a Rembrandt hidden away in someone’s shoe cupboard for 15 years and not telling a soul about it.